For the folks back home it’s bitter cold, maybe even snowing. Around these parts a chill has just come over Be’er Sheva and the harsh wind is blowing sand in everyone’s faces, windows, mouths… I imagine New York in full holiday swing (the Russians here in B7 are getting ready to celebrate as well, and the Old City is decked out in fake Christmas trees). Wherever you are, cozy, creamy dishes like this are just what the chef ordered. 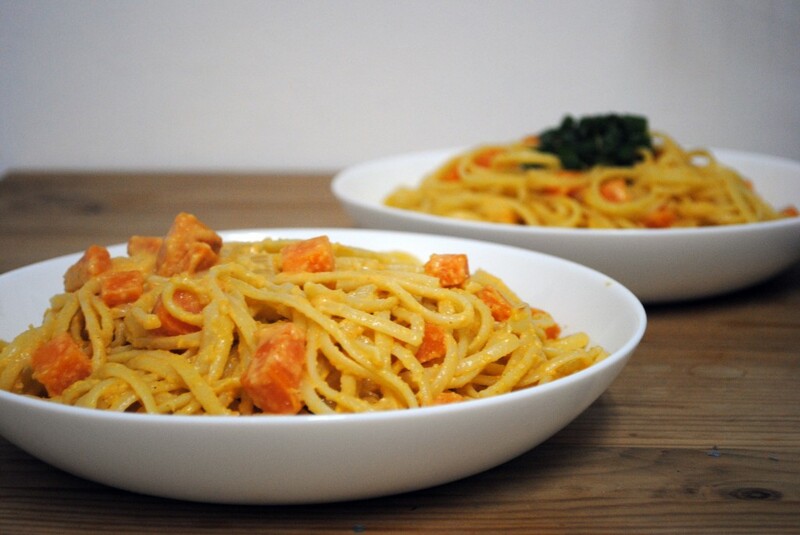 This Linguine with Sweet Potato-Parmesan Cream Sauce is decadence in a bowl, and enough to make you forget the blustery wind howling angrily out the window. Sweet potatoes, cream, and Parmesan form a comforting trifecta of deliciousness while just a hint of ras-al-hanout provides the requisite warm spice that sweet potatoes have such an affinity for. It’s just enough to take the edge off of winter. 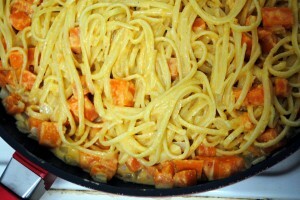 Cook the linguine in a large pot of boiling water until just al dente. Drain and reserve. In a separate pot of boiling water, quickly par-boil the sweet potatoes until slightly tender. Drain and reserve. Heat the butter and olive oil in a large nonstick skillet. Add the onions and cook, stirring occasionally, until soft and translucent. Add the garlic and chile powders and stir to combine. Stir in the heavy cream and bring to a light simmer; mix in the vegetable broth and ras-al-hanout. 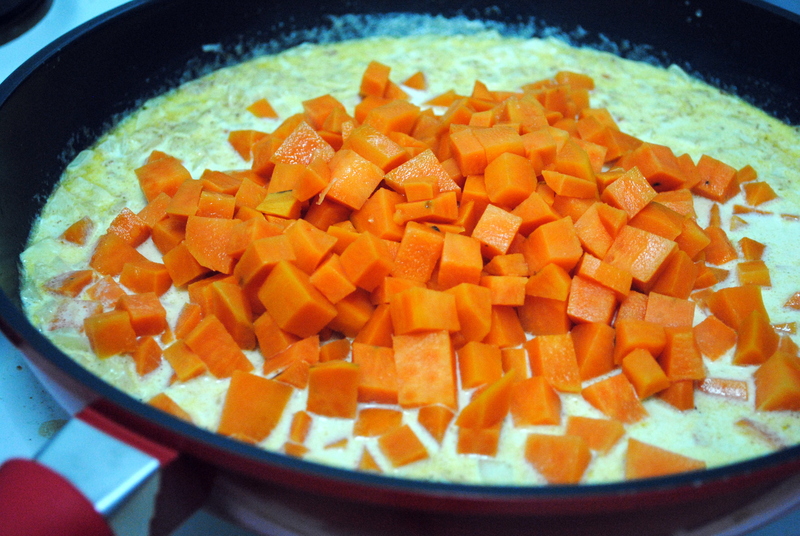 Fold in the sweet potatoes and cook, stirring occasionally, for five minutes, or until the sweet potatoes are the desired softness. Transfer about two cups of the sauce to a blender and puree; return mixture to the pan. Add the Parmesan and stir until fully melted in. Season with salt. Add the reserve linguine and toss in the sauce to combine. Remove from the heat. Serve linguine in shallow bowls and top with chopped green onions, if desired.